With KINGDOM HEARTS III just around the corner with a January 29, 2019 launch date, the team behind the eight million-plus player base title KINGDOM HEARTS Union χ[Cross] has already announced the Classic Kingdom minigames at the 2018 KINGDOM HEARTS Union χ[Cross] Dandelion Meeting [OR Note: We attended it, and you can check out our impressions of this title’s first-ever fan event here] playable in the brand new χ3 [ex tres] mode. In order to reward people for playing these Classic Kingdom games in KINGDOM HEARTS Union χ[Cross] before KINGDOM HEARTS III launches, SQUARE ENIX has decided to give those who meet certain CLEAR goals a reward: the Starlight Keyblade. 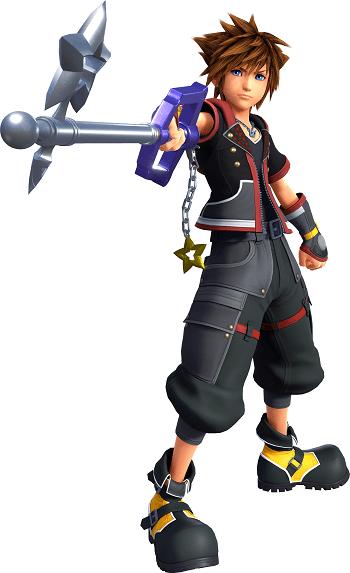 Sora wielding the Starlight Keyblade is a sight to behold. (Image courtesy of SQUARE ENIX). The Starlight Keyblade is the default keyblade weapon that the player wields in KINGDOM HEARTS Union χ[Cross]. 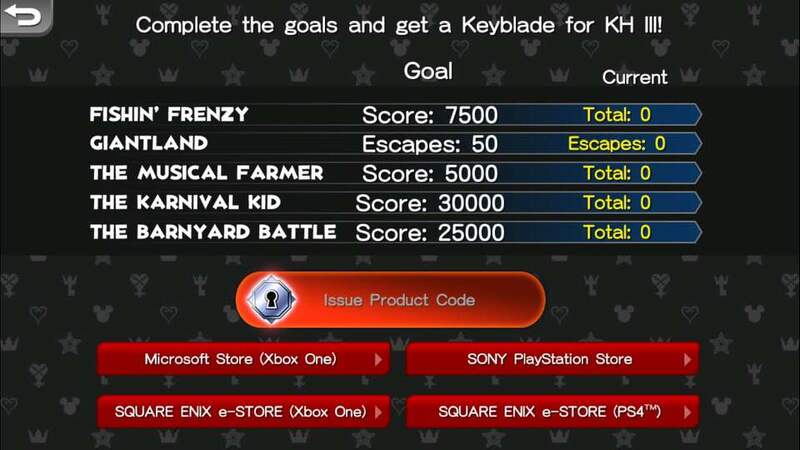 And the only thing that stands between you and getting access to your very own Starlight Keyblade (plus any Forms that may come with it) for when you finally play KINGDOM HEARTS III next year is just reaching the CLEAR goals in five Classic Kingdom games. Thankfully, you have Operation Rainfall here to help you out! So without further ado, let’s first look at how to access the Classic Kingdom games. After that, we will go through each of the five Classic Kingdom games and discuss the necessary CLEAR goals, what each Classic Kingdom’s gameplay is like, and finally, give any tips necessary in order to get the CLEAR as soon as possible and earn yourself a Starlight Keyblade! First thing’s first: You need to download KINGDOM HEARTS Union χ[Cross] for either iOS or Android platforms. You can access the Classic Kingdom titles and the Limited Time Challenge through the brand new χ3 [ex tres] mode from the KINGDOM HEARTS Union χ[Cross] title screen. After clicking it, you’ll see a bunch of things including a return button, game settings, a Community button, access to the official KINGDOM HEARTS website and the official KINGDOM HEARTS Union χ[Cross] Twitter feed, a link to the upcoming The Road to KH III [OR NOTE: As of this guide’s publishing, The Road to KH III only goes to a ‘Coming Soon’ image] and the Classic Kingdom Games and Limited-Time Challenge. Once you are here, just click on the Limited-Time Challenge button to see what you’re in for, and then click the Classic Kingdom button and pick which of the five games you want to clear first that stand between you and your very own Starlight Keyblade. Stop the baddies coming your way! Press <SORA Left> and <SORA Right> to make Sora strike the two columns on the left. Press <MICKEY Left> and <MICKEY Right> to make Mickey strike the two columns on the right. Find a rhythm and time your attacks just right! You want to hit the baddies just as they move next to Sora and Mickey. CLEAR GOAL REQUIREMENT: Your CLEAR goal for this Classic Kingdom game is 25,000 cumulative points, with no timer. GAMEPLAY: There are four paths for the enemies to come down. When they get to the bottom of the screen, press Sora/Mickey to that side to hit them. If you time the hit perfectly, you will see a ‘PERFECT’ appear. If your timing is slightly off, you will see a ‘GOOD’ appear. If you chain ten ‘PERFECT’ hits together, you will see your score multiplier go up. Every subsequent ten PERFECT hits, you’ll earn yet another multiplier increase. The multiplier resets when you get a ‘GOOD’ hit. You will lose a life if you attempt to swing your hammer too early when an enemy is about to reach you (meaning that you can’t just spam the attack button on a side that an enemy is approaching on) or if you just completely miss hitting an enemy. Finally, enemies can move between paths as they come down the screen and as they start to go faster and faster. Listen to the timing of the ‘tick’ sound to know when to swing. The more perfects you get in a row, the bigger multiplier bonus you’ll get. TIPS: Keep the sound on for this one. You’ll hear a ‘tick’ every time the enemies move. You’ll want to hit them at the bottom of the screen on the ‘tick’ as soon as it happens in order to get that ‘PERFECT’ multiplier, which is the real secret to racking up that CLEAR goal. Other than that, just hit everything as it comes down, and make sure that you are worrying about what is about to directly come down to Mickey/Sora and not what is at the top of the screen. The multiplier goes up with every ten ‘PERFECT’ you get, with the value of each hit doubling when you get to sixty in a row. Avoid the giants attacks and escape the room! Step 1: Use the spoon to spring onto the table. Move over to the curtain and press <ACTION> to open it. Step 2: Move over to the pepper shaker and press <ACTION> to hit the giant with it. Then jump to the candle holder. Step 3: Press <ACTION> to jump from candle to candle. Reach the window where Mickey is waiting and you’re home free! CLEAR GOAL REQUIREMENT: Your CLEAR goal for this Classic Kingdom game is 50 cumulative escapes, with no timer. Each successful escape counts as one point. GAMEPLAY: You go from right to left on the bottom of the screen, avoiding the feet. You flip up to the second level by standing on the spoon. You go all the way to the right of the screen (dodging the giants hands) and use the <ACTION> button to open the curtain and get the two chandeliers at the top swinging by the now-incoming breeze. You then go all the way back to the left, use the <ACTION> button again to fling pepper into the giant’s face in order to be timely flung up to automatically grab the swinging left chandelier. When the two chandeliers touch in the middle, you press <ACTION> again to go to the second chandelier. Finally, when that second chandelier is next to the window, you press <ACTION> one last time to escape and get a single escape point. Between the giants legs, on either side by the teapot, the tea cup, or the fruit, and overhead on the chandelier are all safe spots to avoid being squashed. TIPS: This is the easiest game to clear if you have the patience to do it, as there is no time limit. When the giant lifts his right leg, you go beneath it and then stop between his legs. When he lifts his left leg, you scoot under it and stand on the spoon. When he sends you up to the second level, you stand to the left of his left fist on top of the kettle. When he lifts his left fist up, you go beneath it and stand on the tea cup. When he lifts his right first, you go all the way over to the cord and pull it to open the window. You then do the reverse to get back to the other side of the screen. Throw the pepper in the giant’s face and try to time it where you will go up and grab the left chandelier. There is no penalty if you miss, other than having to throw the pepper into the giant’s face again. Connecting between the chandeliers is the trickiest part of this Classic Kingdom minigame, but if you fall, you land where the teacup is. Finally, just time your <ACTION> button presses to escape. I actually got my CLEAR in three attempts, as it really is that simple to win at. One successful escape equates to one point…and you need fifty in order to get the CLEAR. Deliver each customer’s food order correctly! Press <ACTION> to grill the dogs, add ketchup, or move food to the tray. Press <ACTION> again to put drinks or fries back. Once an order is ready, press <Move Up> to give it to the customer. Deliver the correct order to get a high score! Don’t overcook the hot dogs! If you see three smoke trails, that means they’re cooked just right. CLEAR GOAL REQUIREMENT: Your CLEAR goal for this Classic Kingdom game is 30,000 cumulative points. When you make each stage’s point goal, your time to successfully complete the following stage will go down until its nearly impossible to win. GAMEPLAY: Drinks are on the left side of the screen, french fries are on the right, and the ketchup bottle is between the two grills in the center of the screen. As each customer has their order in a thought bubble over his or her head, you have to pick up the relevant fries/drink and cook/pick up hot dogs (and add ketchup!) as necessary. If you leave the hot dogs on the grill too long (the perfect time to pick them up is with three smoke trails, as on the right), you’ll end up burning them (as you can see on the left). TIPS: At the end of the day, this is a matching game. You need to always be sure that you have hot dogs cooking – if you pick up to serve, go ahead and put another one down to cook. When there are three smoke trails above a hot dog, it is ready to serve. It is counter intuitive, but you can pick up the ketchup for an order even if you don’t have a hot dog in hand, and it will automatically apply to the hot dog when you subsequently pick one up. You can squirt on ketchup, even if you don’t have a hot dog on your plate just yet. The more complex orders are worth more points, so you’ll want to do them first to clear each stage as the timer gets shorter and shorter. Finally, you can pick up and put down drinks/french fries, but you can’t put down hog dogs or ketchup. So just be careful when picking up orders! The larger, more complex orders are worth more points. This is important, as you have to reach a point goal before the timer expires in order to jump to the next level. Pack up the eggs and hand them off! Move up to the pipe fittings and press <ACTION> to rotate the fittings. You want to guide the eggs safely into the crates. To hand off the crates, move next to Mickey or Minnie and press <ACTION>. Stand between two crate positions and press <ACTION> to swap crates (or move a crate to the other, empty position). CLEAR GOAL REQUIREMENT: Your CLEAR goal for this Classic Kingdom game is 5,00 points, and there is no in-game timer for you to have to deal with. That 5,000 points can be accumulated across both Game A and Game B modes. GAMEPLAY: There are six pipes that eggs are funneled through: three on the left into the first basket, one pipe that drops straight down into the middle basket, and two that will send eggs down to the right basket. On the left three pipe setup, there is a junction that you can flip to 1) let eggs fall from the far left and middle pipes and 2) let eggs fall from the far left and the far right pipes. On the far right, you just flip it between the 1) left and 2) right pipe. If an egg does not have a fully connecting pipe (meaning the junction is placed incorrectly) to catch it, then it will break and you lose a life. Each basket at the bottom can hold three eggs at most, and you have to continually empty them. If a basket is full and another egg tries to land in it, the egg will break and you’ll lose a life. If there isn’t a basket underneath (Game B Mode only), and an egg tries to fall into an empty spot, you will lose a life. If you don’t rotate the pipes to make sure that the eggs will fall down the pipes, then the eggs will crack and you will lose a life (as seen here). Personally, that was how I lost each one of my lives while I was clearing this Classic Kingdom game. TIPS: Each egg, whether you play Game A or Game B mode, is worth ten points and there is no bonus for dumping a three-egg crate versus a single-egg crate. What this means is that there is zero reason to play on Game B mode if you are trying to get the CLEAR for this game. Game Mode B in this Classic Kingdom game just increases the difficulty without giving you more points for it. In other words, there is no real reason to play it if you’re trying to just get the necessary CLEAR point goal. Instead, just keep clearing out baskets on either side of the screen as you go along in each stage as you can (each stage requires a certain number of eggs to be emptied out of baskets). Additionally, be sure to watch the pipes and make sure that there is always an appropriate junction setting. The middle pipe in the left setup drops eggs faster than either the left or right ones, so you will want to make sure you can always adjust for that one when you see it happening. Just make sure you timely rotate the pipe junctions, and you’ll clear this one easily…eventually. This is probably the most tedious, boring Classic Kingdom game out of them all due to the sheer fact that you have to catch five-hundred eggs (remember, they are worth only ten-a-piece), but you will eventually power through it. Reel in as many fish as you can! Use <UP> and <DOWN> to raise and lower your fishing hook. Once a fish bites, rapidly press <UP> to reel it in. Jumbo fish are closing in on you from the back of the screen. Use <Move Left> <Move Right> to move the boat and get out of the way! Be careful not to let the fishing line get caught on the wooden signs floating your way. CLEAR GOAL REQUIREMENT: Your CLEAR goal for this Classic Kingdom game is 7,500 points, and there is no in-game timer for you to have to deal with. GAMEPLAY: There are four types of fish. The top fish (closest to your boat) are worth ten points, the second row down is worth twenty points, the third row is worth forty points, and the very bottom fish are worth eighty points. Each time you hit a certain point goal of fish caught (the game tells you on the top display how many points you’ve caught and how many you have to go), the monsters will start to come from behind faster and there are signs that’ll appear in the water. These floating signs will make you lose a life if you go below the second tier of fish and the sign floats into your line. The biggest point-value fish are at the very bottom, however you have to watch for floating signs that can break your line. TIPS: Even though the instructions tell you to rapidly press UP and DOWN, don’t bother. It is actually faster to just keep your finger on the UP/DOWN button to both drop the line and then reel back in fish faster. I actually ended up clearing this one by focusing on catching fish from only the top two layers after the first couple of rounds, and just floating back and forth to avoid the monster fish attacks. FISHIN’ FRENZY is mildly time consuming, but it never gets truly frustrating. Just stick with the top two tiers of fish, and you’ll be able to clear this one in no time. And there you have it! You’ve cleared all the requirements necessary to unlock the Starlight Keyblade! When all of those Classic Kingdom titles are completed, you will see this when you go to the Limited-Time Challenge menu option. So…It looks like that SQUARE ENIX has not quite yet generated the Starlight Keyblade DLC codes for us to use, but you’ll now be ready to wield the Starlight Keyblade in KINGDOM HEARTS III for when they do generate them! You can use your Starlight Keyblade when pre-order KINGDOM HEARTS III for the PlayStation 4 (Regular & Deluxe Editions) and Xbox One (Regular & Deluxe Editions) now. You can also join the waitlist for the SQUARE ENIX Store Exclusive Bundle that comes with the KINGDOM HEARTS III Deluxe Edition and three bundle-exclusive BRING ARTS figures of Sora, Donald, and Goofy (PlayStation 4 / Xbox One). Have you managed to unlock the Starlight Keyblade yet? What is your highest score in each Classic Kingdom game?